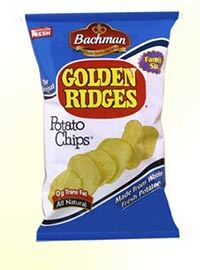 On the previous Bachman's Golden Ridges All Natural Potato Chips packaging, it said 'All Natural' underneath the Potato Chips bit. This time it is under the 0g Trans Fat part, below the graphic of the Chips. Like the Golden Crisp variety, this leads you to believe they are plain and without flavor, but it doesn't make it clear. We called it 'Blue Flavor'. If we were being particularly picky, we would ask what 'Made from Whole Potatoes' means. Do they make Chips from quarter potatoes? Ridged Chips require a certain thickness to ensure the bag isn't full of broken Chips, which this design succeeded in. The thickness allied to the narrow ridges made for a soft crunch. Not because it was an over greasy Chip, but because it was like a thicker than usual regular Chip. The Ridges are narrow and although the salt content was relatively high, there was no residue or over-oiliness. Thick and fairly robust the thin ridges maintained a firm texture. We will invent a word here because we would describe both the smell and the flavor as potatoey. It is described as 'All Natural', but there was probably a bit too much salt to claim that. This did not however detract from the flavor which was an improvement on the Golden Crisp variety.